MS Dhoni made an emphatic return to form against Australia in the recently concluded 3-match ODI series. The wicket-keeper batsman from Ranchi won the man of the match award in that series as he steered India to a 2-1 victory in the series. He had been struggling with the bat of late and a number of fans questioned his position in the ODI team. However, MS Dhoni silenced each and everyone with his batting performances. The 37-year-old will be next seen in action against the Kiwis when India will play a 5-match ODI series in New Zealand. The last time when India toured New Zealand to play an ODI series, they lost the series by a huge margin of 4-0. India toured New Zealand to play a 5-match ODI series in early 2014 but the visitors failed to win the 1st ODI despite Virat Kohli's century. So, the pressure was high on MS Dhoni's Men in Blue to win the 2nd match and make a comeback in the series. India won the toss in the 2nd match and elected to field first due to rainy conditions. The hosts, led by Kane Williamson's 77, put on a total of 271 runs on the board from the allotted 42 overs. India were set a target of 293 runs from 41.3 overs after the application of the DLS method. The openers provided a stable start as India looked good in the chase. 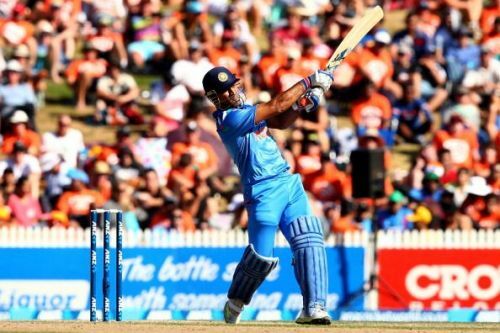 MS Dhoni came out to bat in the 24th over after Ajinkya Rahane was dismissed with Team India's score being 127/3. Dhoni supported Virat Kohli during their 37 run partnership and took over the leading role in India's chase once Virat was dismissed. However, his best efforts could not take India over the line as they fell short by 16 runs in the end. Dhoni had smashed 7 fours and 1 six in that innings before losing his wicket in the 40th over to Corey Anderson.